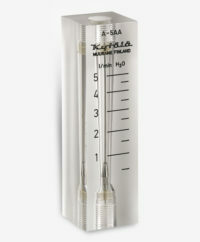 The Kytola variable area flow meter Model A is constructed from a high-quality machined acrylic, and features easy to read scales for accurate monitoring. The connections are BSP 3/8”, and the unit can withstand temperatures up to 75°C and pressure up to 20 bar (30bar/30°C). Ideal for gas or liquid-based applications, these components are typically used in water treatment, sealing water measurements and gas flow measurements. Fixed low/high alarm sensors are available upon special construction request, for specific flow ranges only. Please contact our team to discuss your requirements.